This briefing draws on research from Kenya and other studies on women in the criminal justice system to outline lessons and recommendations on designing and implementing community service and probation for women, in line with the UN Bangkok Rules. The research in Kenya looked at the existing system and experiences of women serving community sanctions. Read the full research report and watch a short documentary. 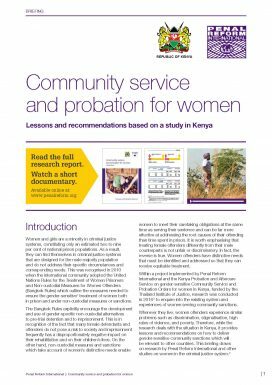 It is published within a project implemented by Penal Reform International and the Kenya Probation and Aftercare Service on gender-sensitive Community Service and Probation Orders for women in Kenya, funded by the Thailand Institute of Justice.